Nexedge and APCO25 Digital radio transmissions. Some sources are up and down so there are a number of alternative links to try below. You only need to download it from one of them as it's the same version on each link. you get up and running. cygwin1 is included in the download, keep this in the same folder as DSD as it's needed to run DSD in Windows. If all the download links above are down then you can download both DSD and cygwin1 below. DSD all you need to do is click DSD when downloaded and in a folder with cygwin1. Thanks getting started with it now. FYI. The minus link didnt work so I used the fileswap ones. Does anyone have a link for the download for the new dsd+ version? Mark5R wrote: Does anyone have a link for the download for the new dsd+ version? Version 1.5 of Digital Speech Decoder Plus (DSD+) has been released. 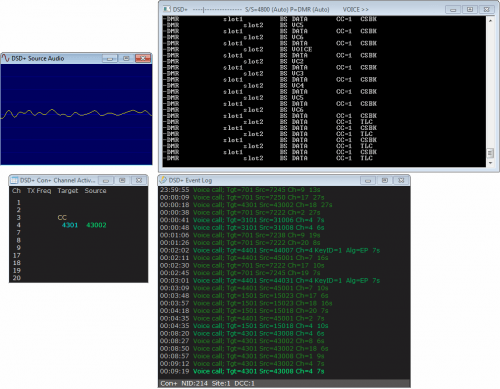 DSD+ is a popular Windows software tool used for decoding digital speech such as P25 with the RTL-SDR. The latest version comes with a simple GUI interface that has an event log that shows call target and source ID history and an audio waveform plot which can help determine if DSD+ is receiving audio correctly. This version of DSD+ has the ability to decode the following protocols.